We design and build bespoke enterprise web applications that meet business-level needs. All your key infrastructure functions can be completed by automated scripts that run at the click of a button. Currently working to reduce CO2 emissions for manufacturing companies by making software that evaluates efficiency of industrial heat pumps in industrial processes. We develop with open-source technology, and you own the code that we develop for you. There are no licenses to tie you down, and it’s yours to evolve with your business. Your web application is designed from the ground up specifically for your business workflows. The software helps you get the job done without ever getting in your way. Our interfaces are fully responsive and work equally well on PCs, tablets and mobile devices. This means only the one software package needs to be created, which saves you money. We work with Ruby on Rails, the state-of-the-art development framework that facilitates best practices in coding standards and security. We were one of the first dedicated Rails teams in the world, and it has been our primary framework for the last nine years. You won’t need training or a manual to use your application. Because your application is built around your workflows, and uses the same language you use at work, it’s easy to find your way around. Everything just makes sense. Host your applications with us for a fixed monthly fee and benefit from our hosting expertise and economies of scale. We follow all the latest security best practices and protect your data with robust disaster recovery techniques and backup data centers. Among first five dedicated Rails teams in the world. Long track record of complex corporate projects. Clients from all around the world. Winner of 2007 Netherlands E-work Award. Distributed team – available almost 24 hours. The frameworks that we use to develop your software. 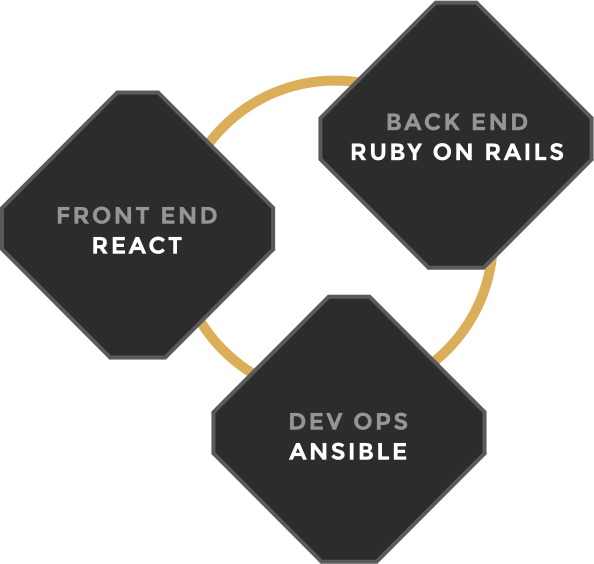 Ruby on Rails A mature and very capable web development framework. React Native Allows native iOS and Android application development. Ansible Automates server and app configuration and deployment.